My husband suffers from allergies, as well as asthma. I hate that he has to deal with that, and it pretty much effects him year round. It seems pretty typical for kids to have allergies when one or both of their parents suffer from them and I have just been waiting to see which of my children has allergies. Well, my 4 year old son has had dark bags under his eyes for a long time and also, has runny noses pretty much every day. He doesn't complain of any other symptoms but I am not sure he would recognize them as problems if he had them. The big one is his runny nose though, he hates that. I am planning to take him to an allergist at some point to see if maybe he has seasonal, environmental or food allergies but for now, I just use over the counter remedies for him. Childhood allergies are no fun, but thank goodness there are some great products out there to help us as parents, give our kids some relief. Because we are now entering the second week of February (!!!) that means spring is right around the corner which also means allergy season is coming too. I have been really excited to receive a product from Kids Relief to try with my son to see if it helps his allergies. This Oral Liquid designed for allergy symptoms comes in a tasty banana flavor, although I don't think it is a strong flavor. I tried it myself and the flavor wasn't overpowering and I could barely taste the banana...which can be a good thing. The bottle itself is small, but you only need a small amount of liquid for one dose so a small bottle is all that is needed. It also comes with a dropper so you can measure the proper dosage. 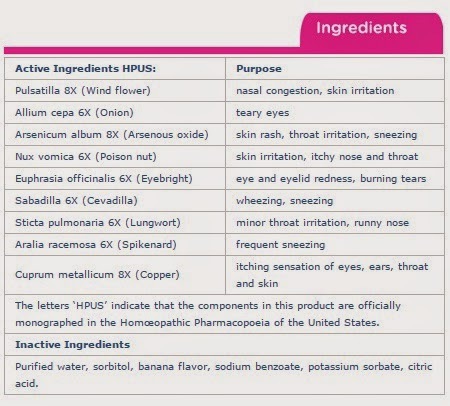 I love how so many natural ingredients cover a multitude of symptoms. This seems like such a great alternative to other children's allergy medicines. My son was apprehensive at first to try out this medicine and cried after the first dose. Why? I am not sure. LOL! BUT, after that first dose, he came to me later that day and asked for more of his special medicine. Ever since then, I have given it to him several times a day. I have noticed that after about 4 days of using this medicine that the dark areas under his eyes have lightened up a bit and he doesn't complain of a runny nose as much. Coincidence? Not sure yet. I think it does have a lot to do with the medicine though. He seems much better. I am going to keep using Kids Relief Allergy Oral Liquid and am looking forward to seeing how he improves even more. You can find this and many other Kids Relief products on their website, and you can also find a store near you that carries this Allergy Relief Liquid. Please be sure to check them out on Facebook as well. If you have little ones who suffer from allergies, try out this product from Kids Relief...so far, I love it and am loving the results I see. Disclaimer: I received no monetary compensation for this post. I did receive free Kids Relief products for review purposes. All quotes and stock photos are from the Kids Relief website and email. All thoughts and opinions are 100% mine.